Following the success of the 2018 PyeongChang Winter Games, global interest in South Korea has continued to surge, ranging from K-pop and TV dramas to language, food and fashion. At the forefront of the country’s worldwide engagement is the Corea Image Communication Institute, a nonprofit public diplomacy organization registered under the Ministry of Foreign Affairs. It has organized a diverse range of forums, networking functions and cultural events to promote Korea since 2003. In 2010, when Seoul hosted the Group of 20 Summit, CICI launched the “C20 Culture Summit,” bringing together the world’s opinion leaders to discuss the nation’s cultural assets and promote them in their home countries. From Tuesday to Wednesday, the annual Culture Communication Forum, which evolved from the C20 Summit, hosted cultural pioneers from around the world. The participants experienced Korean culture by visiting key venues. They also engaged in interactive activities and shared their thoughts afterward. Upon returning home, they will produce content about their trip, such as articles, blog posts, films, artworks and music. “We are all here representing different countries, but in the end, we are here for the same reason -- to give something back to people and share our experiences as artists,” said Noemi Nakai, a Japan-born French actress and film director, at a press conference held at Grand Hyatt Seoul on Wednesday. Nakai was among 10 delegates invited to this year’s forum. Others included Russia’s Olga Sviblova, founder and director of the Multimedia Art Museum; Singaporean celebrity chef and patissier Janice Wong; Chinese curator, writer and art critic Qilan Shen; Spanish chef and jamon slicer Esther Sobrino; and Korea’s own Kim Jung-ja, CEO of Bangawon and Jungyookpo. “South Korea is a creative cinema powerhouse, an amazing example of how to retain local identity and artistic sensibility while proving incredibly popular with global audiences,” Nakai added. At a reception at Grand Hyatt Seoul on Wednesday evening, the results of a survey on Korea’s image abroad were revealed, alongside the winners of the second “Korea through Lens, Video and Photography Contest” organized by CICI, which received entries that illuminated the country’s landscape and cuisine. Some 50 foreign ambassadors and diplomats participated in the grand finale event that gathered 250 guests, including US Ambassador Harry Harris, British Ambassador Simon Smith, Japanese Ambassador Yasumasa Nagamine, Singaporean Ambassador Yip Wei Kiat and Australian Ambassador James Choi. Other VIP guests included former Korean Prime Minister Hang Seung-soo, CJ Group Chairman Sohn Kyung-shik, celebrated actor Ahn Sung-ki, Renault Samsung CEO Dominique Signora and director of the PyeongChang Winter Games’ opening ceremony Song Seung-hwan, who was awarded the K-Culture Communication Award during the gala event. “It’s been absolutely amazing to visit Korea and experience its culture. As an American of Chinese descent, I thought I knew Asia well, but I came to discover that there are so many aspects that I didn’t know about. I will create comics about Seoul based on my visit after returning home,” said Amy Chu, a renowned comic book writer and founder of Alpha Girls Comics, at the press conference. Eran Katz, an Israeli best-selling author and speaker on memory and brain power, said by appointing himself an unofficial Korea ambassador, he made it his mission to show the nation’s beauty and wisdom through his writing. “In my book ‘Five Gifts to the Mind,’ I wanted to bring the wisdom of Korean culture to people around the world by introducing King Sejong the Great and his remarkable scientific and cultural innovations, as well as the Korean metal printing technology, which was invented before Gutenberg’s printing press,” he said. On Tuesday, the 10 guests visited Korea’s cultural attractions and prominent enterprises – the Changdeokgung Secret Garden, Korean Furniture Museum, Amorepacific global headquarters, Onjium cultural research institute and audio-experience space Ode Maison. They had a dinner prepared by traditional Korean beef jerky producer Jungyookpo and Congdu, a restaurant specializing in fermented food, which hosted US President Donald Trump’s state dinner in Korea. Japan’s representative Sebastian Masuda, an artist, art director and founder of Kawaii Culture, explained that the “Kawaii” -- “cute” in Japanese -- culture displays passion and a microcosm of individuality. 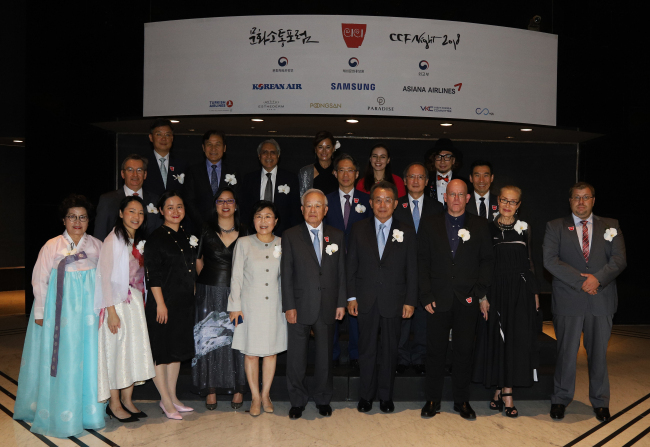 The Culture Communication Forum 2018 was co-hosted with the Ministry of Culture, Sports and Tourism, Ministry of Foreign Affairs and Korean Culture and Information Service, and sponsored by many corporations.